a Garmin 530W and the independent backup unit is a Grand Rapids Mini X. Circuit protection is with the VPX Pro. Currently working on organizing all the wires. That's my panel! At least the one I envisioned. Any trouble mounting the AP panel at the top of the stack? Did you do the panel work or hire it out? Looks fantastic. You're only 3 numbers ahead of me. Guess I need to pick up the pace. RV-14 - Hoping to fly sometime this century. Almost done. Steinair did the panel for me. The AP fits fine and I should still be able to put the canopy release in if I decide to. The GTN650 at the bottom require a slight mod to the sub panel because of its depth but no big deal. The only change I am making is to put in a paddle style flap switch and use the centre switch for "PFD2". Nice looking panel. Did you have to cut out any relief in the canopy frame to clear the outboard upper corners of the GDUs when you close it? The corners of the displays look pretty close to the edge of the panel compared to other -14 panels I've seen, so I'm wondering if the flange on the canopy frame interferes when you try to close it all the way? I sure hope not. 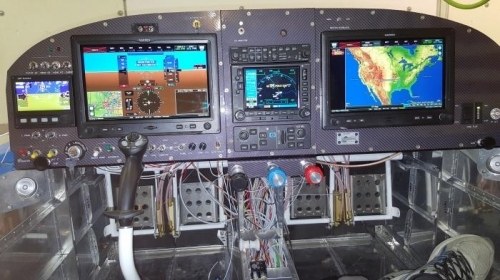 Haven't tried the canopy frame since installing the avionics. I will check and let you know. Thanks for your observation. Put the canopy on today to check clearances and the left G3X display just fits with maybe 1/32 inch to spare! "Even a blind squirrel finds an acorn now and then." I went with an iPad instead of a second Garmin screen. It interacts well with either Garmin Pilot or Foreflight. For attitude/airdata backup I went with the G5. In the picture, the PFD, Navigator and iPad are all sharing flight plan info. The PFD won't pass attitude info yet, because it doesn't know where it is and the magnetometer is not calibrated. The 625 navigator has a built in demo mode and when in use all three devices talk with each other with simulated data sent from the 625. I have simulated several flights. The airplane is currently being painted after 110 hours of flight since first flight in June 2017. The panel has performed as well as I had hoped. I almost never actually touch the radio as I use the G3x interface to tune. Usually from the nearest or flight plan submenus. I use the iPad and Foreflight to create flight plans or alter them and just send the new plans to the G3x and 625. Surprisingly less touching of the 625 than I thought I would as well. 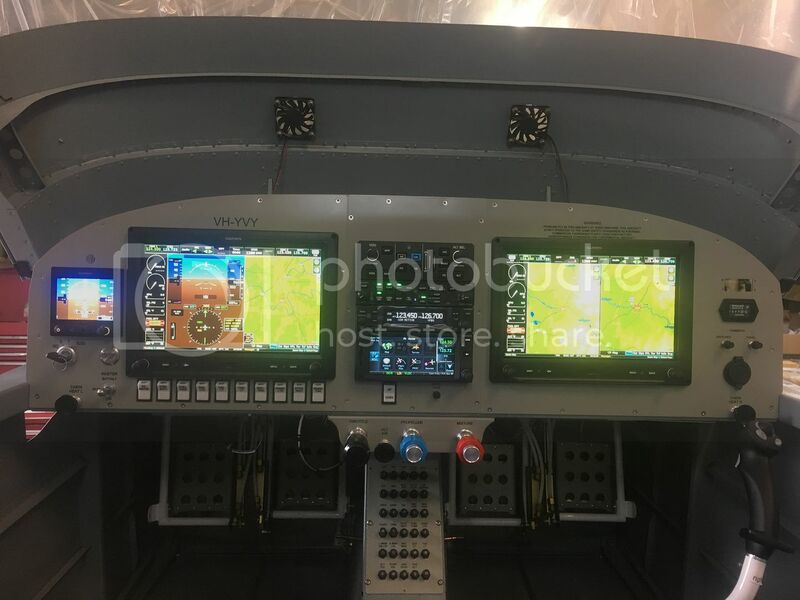 The iPad is very easy to remove or put back into the panel so I take it out after getting established in cruise, using it if needed to alter the route, and them putting it back in the panel for descent and landing. I also use Foreflight to examine weather in flight as it presents a better way to read and access weather data than the G3x weather page. I setup the autopilot with the initial setting supplied by Van's for the G3x and the 14 and have had no issues with them so they remain unchanged.